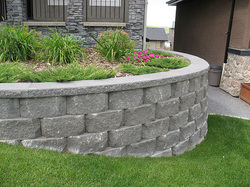 Segmental retaining walls add not only beauty to your property, but also lasting value. There are several sizes of segmental retaining wall block, for a variety of designs and applications. By blending with its surroundings, the natural beauty of a segmental retaining wall is an ideal complement to the existing lines of any site. Call us for a quote on your next project.